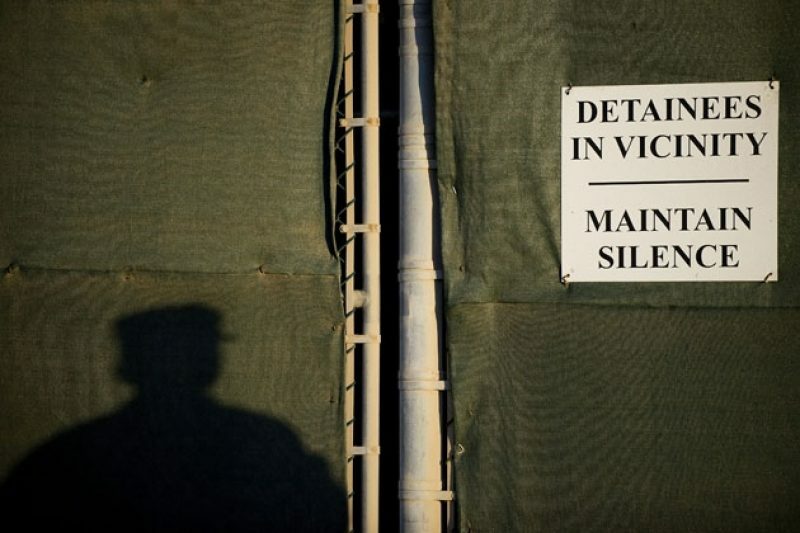 The government argues detainees were “exposed” to classified information during their detention. Update, Feb. 1, 2013: When a pretrial hearing for Khalid Sheikh Mohammed and four other alleged 9/11 plotters began this week, an unknown censor shut off the audio feed from the courtroom even though no classified information was being discussed. Even the judge was caught by surprise, and he has now mandated that no one besides the security officer present in court may suspend broadcasting of the court proceedings, The New York Times reported. Can the government declare anything a Guantanamo detainee does or says automatically classified? That’s the question posed by two challenges to a government order declaring “any and all statements” by the five detainees allegedly behind the 9/11 attacks “presumptively classified.” That includes their own accounts of their treatment, and even torture, at the hands of the U.S. government. The government made that argument this spring at the start of the military commission trials of Khalid Sheikh Mohammed and four others. The government says the defendants’ accounts, if made public without review by a government authority, could reveal details of the CIA’s detention and interrogation efforts. Of course, much information about the programs—including torture of detainees—has long been public. The CIA’s so-called black-site prisons were acknowledged nearly six years ago by then-President Bush. More details about the program were released by President Obama in 2009. The “presumptive classification” order extends to both detainees’ testimony and their discussions with their lawyers. In other words, anything said by a detainee, whether in court or to their counsel, will first need censors’ stamp of approval before it can become public. The American Civil Liberties Union, news outlets, and one of the 9/11 defendants’ lawyers have all challenged aspects of the order. A Gitmo commission judge may consider their arguments at hearings next month. The government’s order mandates that the court proceedings, which are transmitted via closed circuit TV to media and other observers in viewing rooms in the U.S., get a forty-second delay to allow for the blotting out of any sensitive information revealed by the defendants. If something censored in the broadcast is later deemed unclassified, it is restored on the court transcript. This is how the arraignment in this case proceeded back in May. At one point, censors blocked a defense lawyer’s comment that one of the defendants was tortured, only to have it later reinstated for the record. The ACLU filed a brief in May saying that the government’s order of presumptive classification and the forty-second delay violate the public’s right of access to the trial. The ACLU’s motion takes issue with the idea that the government has declared detainees’ “personal knowledge of their detention and treatment in U.S. custody” classified. Their exposure to classified information was forced upon them, the ACLU states, in CIA detention and interrogation programs that are now outlawed. The ACLU argues that an executive order on classification signed by Obama in 2009 says in part that, in order to be properly classified, information must be “under the control of the United States Government.” The ACLU’s brief challenges whether that authority could be extended “categorically to human beings under the government’s control.” [emphasis in original]. The ACLU also argues that the detainees were not in any kind of contractual relationship which would make them liable for the classified information they were exposed to. A Pentagon spokesman declined to comment on the ACLU’s or other challenges to the order. Fourteen media organizations, including the New York Times, the Wall Street Journal, and Fox, also filed an objection to the government’s protective order. Last week the same group filed a brief opposing the closing of certain proceedings in the case against Abd al Rahim al Nashiri, the alleged mastermind of the 2000 attack on the U.S.S. Cole. That case was governed by a similar protective order, signed by the same judge presiding over the 9/11 case, James Pohl. That’s part of what makes it unlikely Pohl will be open to rescinding the government’s order, says Wells Bennett, a visiting fellow in national security at the Brookings Institution and a contributor to the widely read Lawfare blog. “Presumptive classification has already been in use in the Guantanamo trials. For Pohl to turn around, at this point, would be bucking the trend,” says Bennett. Military commissions were temporarily suspended when Obama took office, and revamped later in 2009 when Congress passed a new Military Commissions Act strengthening defendants’ rights. The 9/11 case is seen as a high-profile test of the system, which has obtained four convictions under Obama so far. The Obama administration originally planned to try the five in civilian courts but transferred the trial to the military commission last year after Congress made it all but impossible to bring Guantanamo detainees into the U.S.
A separate challenge to the government’s stance was filed in April by James Connell, the civilian Defense Department lawyer representing one of the 9/11 defendants, Ammar Al-Baluchi (also known as Abd al Aziz Ali). The motion challenges the very notion of presumptive classification. Anyone involved in the case has to sign a “memorandum of understanding” indicating their responsibility for access to classified information, as defined in the protective order. The defense needs to give warning when they plan to use classified information, and to submit any information they want unclassified to a government-appointed security officer for review. In practice, according to Connell, this means lawyers have to get approval to use even their client’s birthdate, if the source for it is the detainee’s—presumptively classified—statement. The resulting difficulties for the defense, the motion maintains, violate attorney-client privilege and Sixth Amendment protections. Connell also claims that presumptive classification violates procedures laid out in Obama’s executive order and elsewhere. According to those standards, information can only be classified after an evaluation that its relevance to national security outweighs the public’s right to information. Declaring detainees’ potential statements preemptively secret, Connell maintains, is therefore too broad to be considered an “original classification.” (Only nuclear information is “born classified,” under a World War II-era law). Connell’s motion also chronicles how presumptive classification of detainees’ statements was gradually established as the norm in cases involving Guantanamo detainees, in both military commissions and federal court, but doesn’t have much precedent outside Gitmo. The government’s response to Connell’s motion, filed in May, echoes its justification for the 40-second broadcast delay. The response says that the Guantanamo procedures don’t make anything classified that shouldn’t be. Presumptive classification isn’t a “new category” of classified material, it argues, but rather, “simply is the control mechanism,” and the least intrusive process possible by which to separate properly classified information from unclassified.